Diabetes after pancreatic cancer: What type am I?? Type 1 diabetes has got a bit of publicity this week as Home Secretary, Theresa May has announced that she has been diagnosed with type 1 diabetes. Known as insulin-dependent diabetes, it generally affects younger people (often under the age of 40) but can occur in older people too. 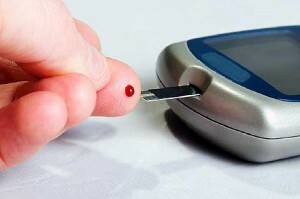 People with type 1 diabetes have a pancreas that does not produce any insulin (to regulate blood sugar levels) and so need to have insulin injections to enable the glucose in the blood to move into the cells where it is converted into energy. Left unchecked, high blood sugar levels can seriously damage a body’s organs. I was diagnosed with type 2 diabetes about a year before my diagnosis for pancreatic cancer and, despite the fact I was not overweight and had no family history of the disease, no-one, including myself, put this down to be a pre-cursor for pancreatic cancer. We now know from research that individuals in whom diabetes had only recently been diagnosed (less than 4 years) they have a 50% greater risk of developing pancreatic cancer compared with those who have had diabetes for 5 or more years. A new diagnosis of diabetes in patients who are thin is of particular importance for GPs and other clinicians to look out for as a possible symptom of pancreatic cancer. So, after having surgery for pancreatic cancer in September 2007. I have been managing my type 2 diabetes through a combination of diet and drugs; in my case Gliclazide. This drug acts to increase the amount of insulin produced in the body and, for the first couple of years, everything was under control and I was getting ‘model patient’ reports from my Consultant Endocrinologist. Gradually though, the blood sugar levels have been creeping up and these past 6 months in particular I reached a point whereby I was on the maximum permitted dose of Gliclazide and, despite this, there was a limited effect on my now soaring blood sugar levels. I had also been feeling very tired which I put down to the very long hours I regularly put in at PCA along with a recent stressful work-related situation. And I was constantly thirsty and also got into a habit of waking up frequently throughout the night. This I now know is (mostly) related to the very high blood glucose levels. A decision was made by my consultant that the time has come to start insulin injections. I had been hoping that this day would never come as the thought of injecting myself multiple times a day was not that appealing! But what type am I? Apparently I am ‘special’ – in terms of diabetes classifications anyway! I don’t sit in any of the pre-defined classifications of Type 1 or Type 2 – so perhaps we can call it Type 1 and a half? I started on Monday after a visit to my lovely diabetic nurse, Jackie who took me through the ritual and paraphernalia that goes with insulin injections: injection pen (which is actually very neat and portable), daily disposable needles, where to order the sharps bin from the local authority (it’s free!) and how often to check my blood glucose levels, monitoring my carbohydrate intake and even how to inform the DVLA that I am now an insulin dependent diabetic. I was nervous about giving myself the first injection but I can honestly say, it does not hurt at all. It is a very swift, painless procedure. The difficult bit will be managing the carbohydrate intake and exercise and matching this up to relevant insulin doses in the future. However, as always, there is an app to help with that which I have downloaded onto my smartphone. This is all going to become a new normal for me. But I have experienced a new normal before: I have had to come to terms with the fact that I have had pancreatic cancer and this diagnosis, despite being nearly 6 years on, will always be with me and I will always be in fear of it returning. However, I am lucky to still be here to experience the ‘new normals’ in life and daily insulin injections are something millions of people put up with every day, including Theresa May – and so can I. It is a minor inconvenience when you have survived pancreatic cancer. If you have experienced diabetes with pancreatic cancer let us know how you have got on in our new pancreatic cancer forum.